Secret Spaces takes a gander at the city's oft-overlooked spaces. Spot something of interest? Break out the zoom lens and upload it straight to the Curbed inbox. 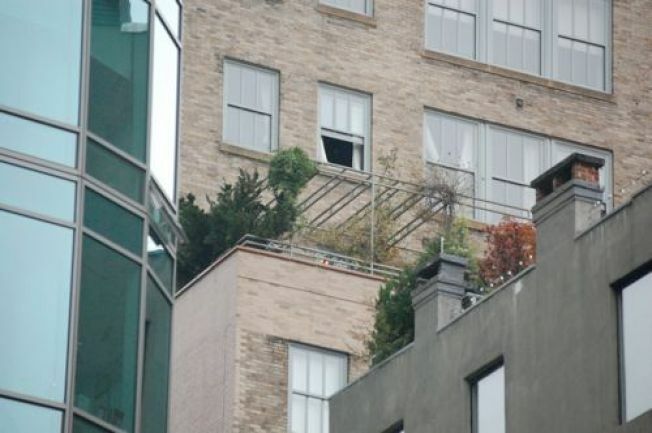 Here's one poor neighbor's attempted escape from the waving, reflective (read: blinding) glass curtains of the Sculpture for Living, the Gwathmey Siegel-designed, 39-unit residential condo on Astor Place. Tucked between the Carl Fischer building and 439 Lafayette Street is a small oasis atop the rooftop penthouse (do recall the starstruck swoon that befell us back in September, when the unit went on the block for nearly $8.5 million. This is, after all, Matt Damon's building -- though not his unit.) As for the cowering neighbors, may we suggest a mini-forest of very, very tall topiaries to obscure the Sculpture for Life's residents' faces pressed up against the glass like guppies. Nature now!